When viewed close up, Comet Hyakutake showed some interesting features. 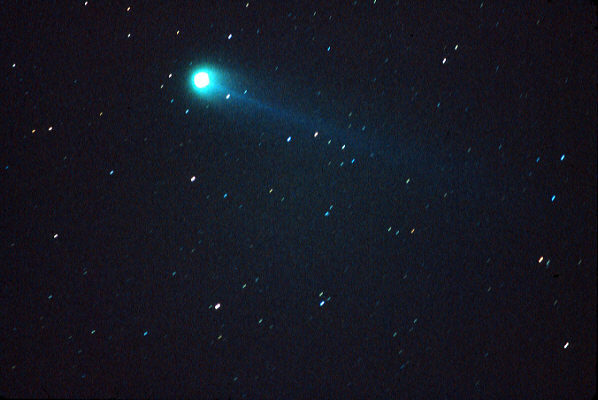 The coma had a striking green color, and during the evening of closest approach to Earth, the comet could be seen moving across the field of view in the telescope. This image also shows the bluish gas tail. Unlike most bright comets, Hyakutake did not have a prominent dust tail. Technical Notes: Getting this exposure was quite an adventure. March 25, 1996 was Oscar night, and after the end of the show, I drove north into the Mojave Desert to a dark sky site. About two minutes after I pulled to the side of the road, the sky clouded over. I then drove into the San Bernardino Mountains, where I discovered that conditions were no better. I decided to try the desert one more time, without success. By this time it was around 12:30 AM so I drove back home. When I got home the sky was clear, and I managed to take a series of exposures. Just after my last exposure of the morning it began to rain!